Blackgrass (Alopecurus myosuroides) is a monocot weed in the Poaceae family. In Denmark this weed first evolved multiple resistance (to 3 herbicide sites of action) in 2001 and infests Winter wheat. Multiple resistance has evolved to herbicides in the Groups A/1, B/2, and K1/3. These particular biotypes are known to have resistance to clodinafop-propargyl, cycloxydim, fenoxaprop-P-ethyl, florasulam, flupyrsulfuron-methyl-sodium, iodosulfuron-methyl-sodium, mesosulfuron-methyl, pendimethalin, and pyroxsulam and they may be cross-resistant to other herbicides in the Groups A/1, B/2, and K1/3. Alopecurus myosuroides 101 verified cases. Most of these cases are seed samples sent by farmers or consultants on suspicion of resistance. They have been tested in pot experiments including a susceptible and a resistant reference population. In most cases fenoxaprop-P, flupyrsulfuron and cycloxydim have been tested, in some cases also pendimethalin and/or prosulfocarb. From 2013 mesosulfuron + iodosulfuron (Atlantis) and florasulam + pyroxsulam (Broadway) have also been included in some of the test. In most cases we find resistance to fenoxaprop and flupyrsulfuron but not to cycloxydim. Around 10% of the samples were less susceptible to pendimethalin or prosulfocarb than the susceptible reference population. Resistance to ACCase inhibitors seems to be caused by an altered target site at the 1781 position in approximately 20% of the resistant populations, while resistance to other SoA more likely seems to be due to enhanced metabolism. Reports from practice indicate increasing resistance to Atlantis and Broadway. Genotyping has been conducted for some of the samples by IDENTXX and Bayer CropScience. The most common mutation is at the 1781 position (Ile to Leu) and seems to be present in around 10% of the resistant populations. A survey on untreated plots in agricultural fields all over Denmark showed that A. myosuroides was resistant in 30% of the fields (to be presented in Denver in May). References: Keshtar E. (2015): Ecological fitness, molecular basis and selection of resistant blackgrass (Alopecurus myosuroides) biotypes. PhD dissertation, Department of Agroecology, Aarhus University. Keshtkar E., Mathiassen S.K., Moss S.R., Kudsk P. (2015): Resistance profile of herbicide-resistant Alopecurus myosuroides (black-grass) populations in Denmark. Crop Protection, vol. 69, 83-89. Greenhouse trials comparing a known susceptible Blackgrass biotype with this Blackgrass biotype have been used to confirm resistance. For further information on the tests conducted please contact the local weed scientists that provided this information. There is no record of differences in fitness or competitiveness of these resistant biotypes when compared to that of normal susceptible biotypes. If you have any information pertaining to the fitness of multiple resistant Blackgrass from Denmark please update the database. The Herbicide Resistance Action Committee, The Weed Science Society of America, and weed scientists in Denmark have been instrumental in providing you this information. Particular thanks is given to Solvejg Mathiassen for providing detailed information. Rosenhauer, M. ; Jaser, B. ; Felsenstein, F. G. ; Petersen, J.. 2013. Development of target-site resistance (TSR) in Alopecurus myosuroides in Germany between 2004 and 2012. Journal of Plant Diseases and Protection 120 : 179 - 187. 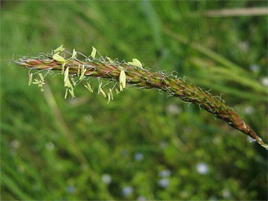 Alopecurus myosuroides is one of the most important grass weeds on arable land in Germany. For many years, it has developed herbicide-resistant populations. ACCase- and ALS-inhibiting herbicides, in particular, have lost significant efficacy. Two different mechanisms are commonly known to confer resistance to herbicides: target-site resistance (TSR) and non-target-site resistance (NTSR). In Germany, onlyapproximately 5 to 10% of the herbicide-resistant black-grasspopulations have been reported to show TSR so far. To quantify the status and the distribution of TSR in Germany, 653 black-grass samples were collected between 2004 and 2012 all over the country. The samples were tested by bioassays and genetic analysis. Averaged over all tested samples, ACCase-TSR increased from 5.0% in 2004 to 54.3% in 2011. In 2012, the proportion of ACCase-TSR was lower than the previous years (38.5%). Similarly, ALS-TSR rose from 0.8% in 2007 to 13.9% in 2012. Regions with a high density of resistant black-grass samples were identified in the north and south of Germany. The data suggest a rapidly working selection of herbicide-resistant populations which may be due to current agricultural practices and the increasing use of herbicides acting on a single site..
Kaiser, Y. I. ; Menegat, A. ; Gerhards, R.. 2013. Chlorophyll fluorescence imaging: a new method for rapid detection of herbicide resistance in Alopecurus myosuroides. Weed Research (Oxford) 53 : 399 - 406. Due to the steadily increasing number of putative herbicide-resistant weed populations, the demand for rapid in-season tests is rising. In this study, we introduce a new quantitative herbicide-resistance test system based on chlorophyll fluorescence imaging analysis of photosynthesis-related parameters. Susceptible and herbicide-resistant populations of Alopecurus myosuroides (black-grass) were cultivated in multiwell tissue culture plates containing nutrient agar and different dosages of fenoxaprop-P-ethyl and mesosulfuron+iodosulfuron. The maximum quantum efficiency of the PSII was measured 3 h after transplanting (HAT) and then for seven days every 24 h. Data of maximum quantum efficiency of the PSII were compared with standard whole-plant pot tests and molecular tests for target-site mutations. It was possible to fit dose-response curves and calculate corresponding resistance factors for ED90 for all populations tested using the chlorophyll fluorescence imaging. It was possible to distinguish between resistant and susceptible populations. The results of the chlorophyll fluorescence imaging corresponded well with the standard whole-plant pot tests in the glasshouse. However, populations with proved target-site mutations did not differ from other herbicide-resistant populations in the maximum quantum efficiency values of the PSII. We conclude that the chlorophyll fluorescence imaging provides reliable data on herbicide resistance for both modes of action tested in a shorter time and using less space, compared with standard whole-plant pot tests in the glasshouse..
Marshall, R. ; Hanley, S. J. ; Hull, R. ; Moss, S. R.. 2013. The presence of two different target-site resistance mechanisms in individual plants of Alopecurus myosuroides Huds., identified using a quick molecular test for the characterisation of six ALS and seven ACCase SNPs. Pest Management Science 69 : 727 - 737. BACKGROUND: Target-site resistance to ALS- and ACCase-inhibiting herbicides in the grass weed Alopecurus myosuroides is associated with well-characterised allelic variants encoding ALS- and ACCase-based resistance. The potential for combined ALS and ACCase resistance presents a threat to future control, given the extent to which these herbicides are used. The authors present a primer extension method for rapid detection of known resistance-conferring substitutions. RESULTS: Individuals showing combined resistance to field-rate mesosulfuron+iodosulfuron and cycloxydim were identified in four field-collected populations, with proportions ranging from 30 to 100%. Genotyping with the SNaPshot primer extension kit showed the T197 and L574 ALS and L1781 ACCase isoforms to be associated with ALS and ACCase resistance whenever they occurred. CONCLUSION: Combined ALS and ACCase target-site resistance threatens future control of A. myosuroides. The SNaPshot extension assay provides a reliable new multiplexable method for characterising known allelic variants of the ALS and ACCase genes of A. myosuroides. The method offers significant advantages over both CAPS/dCAPS and PASA in that full genotyping can be accomplished at any nucleotide position using a single extension primer..
Cummins, I. ; Wortley, D. J. ; Sabbadin, F. ; He ZheSi ; Coxon, C. R. ; Straker, H. E. ; Sellars, J. D. ; Knight, K. ; Edwards, L. ; Hughes, D. ; Kaundun, S. S. ; Hutchings, S. J. ; Steel, P. G. ; Edwards, R.. 2013. Key role for a glutathione transferase in multiple-herbicide resistance in grass weeds. Proceedings of the National Academy of Sciences of the United States of America 110 : 5812 - 5817. Multiple-herbicide resistance (MHR) in black-grass (Alopecurus myosuroides) and annual rye-grass (Lolium rigidum) is a global problem leading to a loss of chemical weed control in cereal crops. Although poorly understood, in common with multiple-drug resistance (MDR) in tumors, MHR is associated with an enhanced ability to detoxify xenobiotics. In humans, MDR is linked to the overexpression of a pi class glutathione transferase (GSTP1), which has both detoxification and signaling functions in promoting drug resistance. In both annual rye-grass and black-grass, MHR was also associated with the increased expression of an evolutionarily distinct plant phi (F) GSTF1 that had a restricted ability to detoxify herbicides. When the black-grass A. myosuroides (Am) AmGSTF1 was expressed in Arabidopsis thaliana, the transgenic plants acquired resistance to multiple herbicides and showed similar changes in their secondary, xenobiotic, and antioxidant metabolism to those determined in MHR weeds. Transcriptome array experiments showed that these changes in biochemistry were not due to changes in gene expression. Rather, AmGSTF1 exerted a direct regulatory control on metabolism that led to an accumulation of protective flavonoids. Further evidence for a key role for this protein in MHR was obtained by showing that the GSTP1- and MDR-inhibiting pharmacophore 4-chloro-7-nitro-benzoxadiazole was also active toward AmGSTF1 and helped restore herbicide control in MHR black-grass. These studies demonstrate a central role for specific GSTFs in MHR in weeds that has parallels with similar roles for unrelated GSTs in MDR in humans and shows their potential as targets for chemical intervention in resistant weed management..
Délye, C. ; Menchari, Y. ; Michel, S. ; Cadet, É. ; Corre, V. le. 2013. A new insight into arable weed adaptive evolution: mutations endowing herbicide resistance also affect germination dynamics and seedling emergence. Annals of Botany 111 : 681 - 691. Background and Aims: Selective pressures exerted by agriculture on populations of arable weeds foster the evolution of adaptive traits. Germination and emergence dynamics and herbicide resistance are key adaptive traits. Herbicide resistance alleles can have pleiotropic effects on a weed's life cycle. This study investigated the pleiotropic effects of three acetyl-coenzyme A carboxylase (ACCase) alleles endowing herbicide resistance on the seed-to-plant part of the life cycle of the grass weed Alopecurus myosuroides. Methods: In each of two series of experiments, A. myosuroides populations with homogenized genetic backgrounds and segregating for Leu1781, Asn2041 or Gly2078 ACCase mutations which arose independently were used to compare germination dynamics, survival in the soil and seedling pre-emergence growth among seeds containing wild-type, heterozygous and homozygous mutant ACCase embryos. Key Results: Asn2041 ACCase caused no significant effects. Gly2078 ACCase major effects were a co-dominant acceleration in seed germination (1.25- and 1.10-fold decrease in the time to reach 50% germination (T50) for homozygous and heterozygous mutant embryos, respectively). Segregation distortion against homozygous mutant embryos or a co-dominant increase in fatal germination was observed in one series of experiments. Leu1781 ACCase major effects were a co-dominant delay in seed germination (1.41- and 1.22-fold increase in T50 for homozygous and heterozygous mutant embryos, respectively) associated with a substantial co-dominant decrease in fatal germination. Conclusions: Under current agricultural systems, plants carrying Leu1781 or Gly2078 ACCase have a fitness advantage conferred by herbicide resistance that is enhanced or counterbalanced, respectively, by direct pleiotropic effects on the plant phenology. Pleiotropic effects associated with mutations endowing herbicide resistance undoubtedly play a significant role in the evolutionary dynamics of herbicide resistance in weed populations. Mutant ACCase alleles should also prove useful to investigate the role played by seed storage lipids in the control of seed dormancy and germination..